The rainy season has begun in Nicaragua again, so we have begun planting our small trees in the deforested areas of Laguna de Apoyo Nature Reserve. Our volunteers at FUNDECI/GAIA are busy taking the small trees from the vivero (tree nursery) to the reforestation sites. Nils examines the trees in our vivero, choosing the most robust to be planted in one of our reforestation plots. Photo by Frank Lindt. We grow native species from seeds harvested within the Laguna de Apoyo Nature Reserve, thereby protecting the genetic pool in the area. Our volunteers do all this work, for which they do not receive any salaries. Our volunteer at Estacion Biologica, Nils, shows off the next candidate tree for replanting in the Laguna de Apoyo Nature Reserve. Photo by Frank Lindt. We grow trees in our vivero using recycled materials whenever possible. Nils demonstrates in the above photo how we reuse milk bags as reforestation bags. The milk bags are stronger than plastic reforestation bags and by using them, we do not generate additional plastic waste. FUNDECI/GAIA volunteer Nils hikes up the Apoyo volcano crater to one of our reforestation sites. Photo by Frank Lindt. 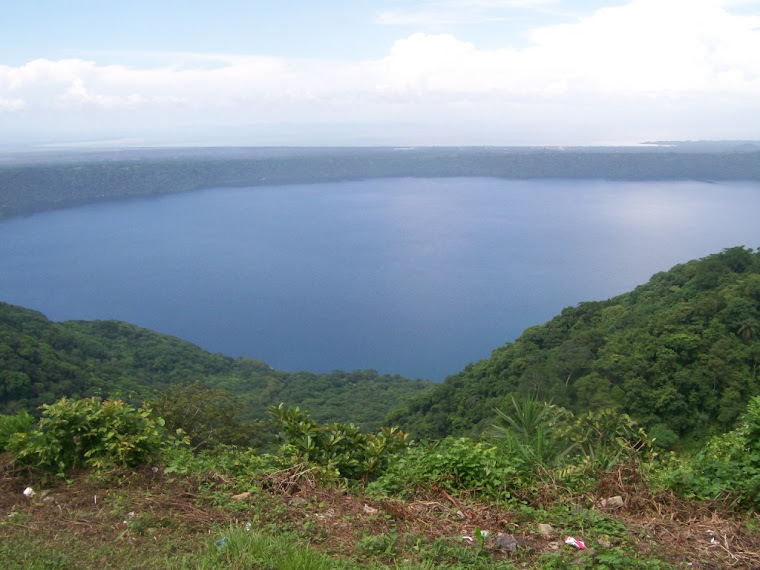 Most of the more than 2000 hectares of land in Laguna de Apoyo Nature Reserve is owned privately. Many small agricultural plots are found throughout the area, and areas deforested for timber or firewood harvesting, housing or cattle pasture. We develop agreements between landowners inside the Reserve, the municipal government of Catarina, and the Ministry of Natural Resources and the environment, to dedicate plots of land back to natural forest. This negotiation is important, because otherwise, we would not be able to resolve the reasons why the forest went away from the site in the first place. The landowners participate voluntarily in our reforestation program. Nils negotiates his way past a cow to reach the reforestation site. Photo by Frank Lindt. The plots we reforest are selected by the owners without any encumbrance from us. We simply perform the service of reforesting for them, and we monitor wildlife populations in some of them as they return to multistory forests. Frank carries trees up the slopes to their new home in one of the reforestation sites. Photo by Frank Lindt. Helping natural forest to return to its most glorious state is not easy work. Some of the plots we reforest are distant, so we may plant only a few trees at a time. But reforestation of a natural habitat means doing more than planting trees-we also care for them until they are large, but providing frequent visual inspections, cleaning planted areas of vines which may choke out the small trees, and removing fire hazards such as dry organic matter, especially in the dry season when forest fires may spread easily. Nils have arrived at the reforestation site after a long walk uphill. Photo by Frank Lindt. Some seeds will fall within any deforested area, transported by wind, birds, or other animals, but the plants may not survive harsh dry seasons, especially when forest fires are frequent. Some people clear land clandestinely to use as cattle pasture, and they may encroach on the private land owned by others. FUNDECI/GAIA volunteers discuss our reforestation activities with one of the landowners in our program. Photo by Frank Lindt. By working with private landowners, we form alliances in which local farmers can continue to plant in areas they wish, while we reforest in area that the landowners find unproductive or wish to obtain the environmental services of a forest. Forests help protect against erosion, fires, and dehydration of the soils, creating humid microclimates more productive for small agriculture plots. The landowner decides where to plant trees and where he wants to continue his agricultural or other activities, and we respect his wishes. A local landowner explains where he wants to have trees planted and where to leave land available for agriculture. Photo by Frank Lindt. We consider our reforestation program to be a type of enrichment planting, because some trees will regenerate without our assistance. We add diversity to the tree species found in our plots, and we also promote rapid growth of the trees by clearing them of vines and reducing the effects of forest fires. We can also call this kind of activity ecological restoration, which means making the natural forest return to an area affected by man. A FUNDECI/GAIA volunteer plants a small tree. Photo by Frank Lindt. Our volunteers are the backbone of this project. They provide much of the labor and help greatly to define it. The wildlife of Laguna de Apoyo Nature Reserve deserve more trees as habitat and food sources, and we are helping to provide them. Nils removes a small tree from its plastic bag in a reforestation planting activity. Photo by Frank Lindt. By planting the trees during the early months of the rainy season, the small trees have a greater opportunity to become larger and more resistant for their first dry season. We work to make the replanted trees grow as quickly as is possible. During the dry season, we will even bring small amounts of water to them. A baby tree becomes part of the forest . Photo by Frank Lindt. Not all the trees planted in our reforestation activities survive. We plant many species which experience high mortality rates, and we plant in places which are not ideal for tree planting. Nonetheless, by recreating shade and protecting soils, we slowly improve the forest quality. We see the difference, too. Monkey populations have been expanding in Laguna de Apoyo Nature Reserve, thanks in part to increased forested area. Landscapes are more beautiful, and the lake is protected from excessive quantities of eroded soils. Nils is proud of his newly planted tree in one of our reforestation plots. Photo by Frank Lindt. Would you like to help us protect the forests of Laguna de Apoyo Nature Reserve? By contributing your time and efforts to reforestation, you help to protect this beautiful spot for the wildlife and for the children of Nicaragua. Please consider volunteering with us. It's a great way to spend some time, getting in great physical shape, and enjoying the beautiful Lake Apoyo between tree plantings! Friday, June 15, beginning at 8 am, we will be conducting a reforestation activity with the local community, Movimiento Ambiental Guardabarranco, MARENA, and the municipality of Catarina. You are invited to participate! We will be planting trees in deforested areas in a community property about five hundred meters north of Estacion Biologica. Please meet us at Estacion Biologica Laguna de Apoyo on Friday! Contact us at apoyo@gaianicaragua.org. Find more about our reforestation efforts at www.gaianicaragua.org/reforestation.html.